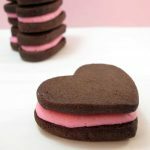 Stamped conversation heart cookies, a Valentine’s Day food craft idea from my book, Sugarlicious. 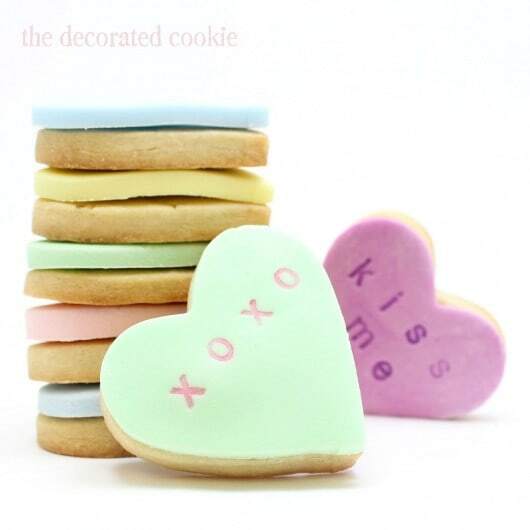 For my cut-out cookie recipe click HERE. 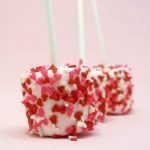 Buy fondant from the craft store or cake decorating store, or to make homemade marshmallow fondant, click HERE. For a royal icing recipe instead of fondant, click HERE for a royal icing recipe. And for tips on flooding if you choose royal icing, click HERE. * The frosting, icing or corn syrup is used to adhere the fondant to the cookie. Use anything you prefer, including store-bought frosting. 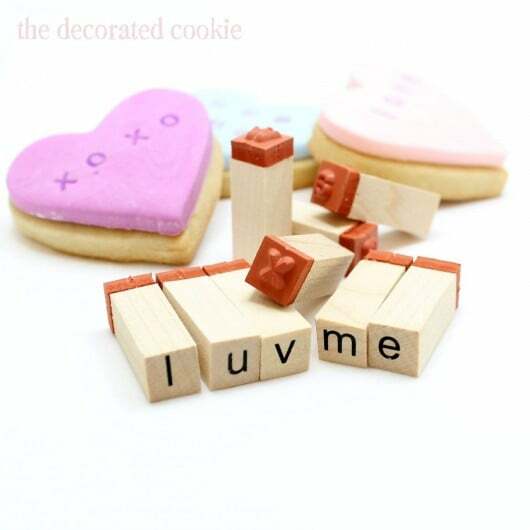 Find fondant, cookie cutter, writers and rubber stamps in the craft store. Because my method is tough on edible writers, choose the least expensive brand with a thick tip. For food coloring, I use Americolor Soft Gel Pastes. Note you can also buy pre-colored fondant in pastels at the craft store. If so, you won’t need the food coloring. 1. Prepare cookie dough according to the recipe, chill and roll out on a floured surface. Cut out hearts and bake according to the recipe. Let cool completely. 3. Roll out preferred color of fondant on a surface dusted with confectioner’s sugar to prevent sticking, and cut out hearts. 4. 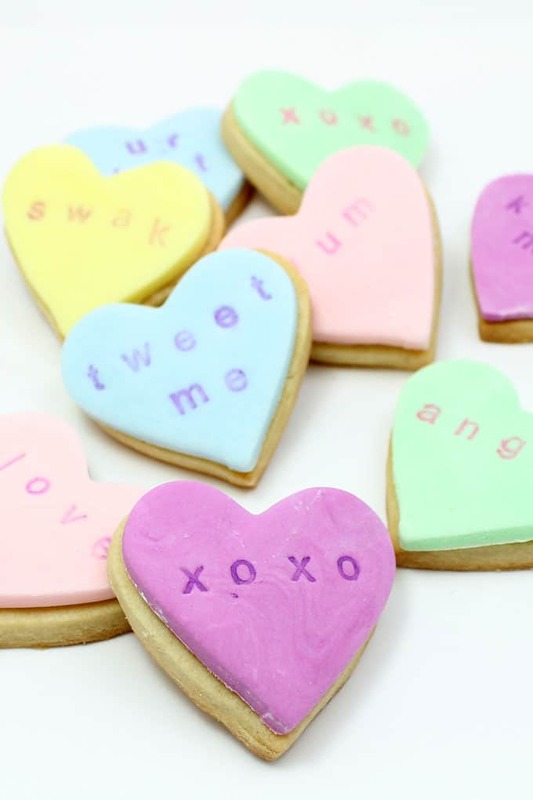 Spread a small bit of icing, frosting or light corn syrup, whichever you prefer, on a cookie and adhere a fondant heart, smoothing with your fingers. 5. Spell out your message with the rubber stamps and use your preferred color of edible writer to cover the raised letters on the stamp. 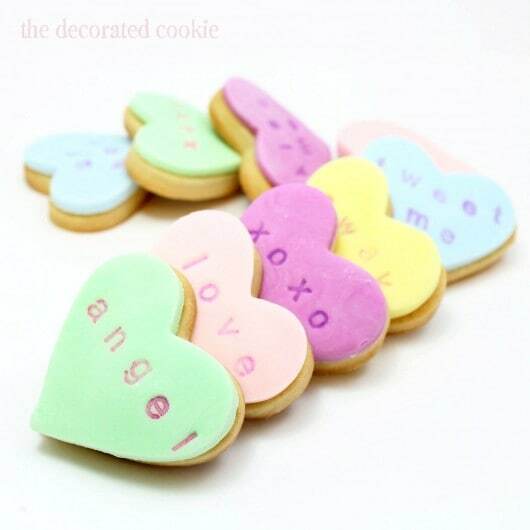 Gently impress the colored letters onto the fondant. I am so happy that you shared this technique. I have had a set of rubber stamps like yours that I have never used. Now I know what to do with them! I’m glad I never used them with ink. I’ve just posted on my website photos with a link to you of course ! OH these are just too cute! I think I need to get my hands on some rubber stamps! 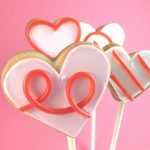 These are so cute—they are definitely the best version of ‘conversation heart’ cookies I’ve seen, great job! I am so impressed by your talent! I wish I had just a little creativity to attempt these cookies. They are so very cute! 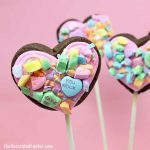 I know they are tastier than the candy hearts! These are really cute and now I need to get myself a set of stamp letters. I attempted to make these cookies and the cookies cooked beautifully 🙂 but when i cup the fondant out using the same shape n size cutter the fondant was bigger than my cookie 🙁 almost like my cookie had shrunk! Is there something i did that made this happen? Oh my gosh, Emily, I’ve never heard of a shrinking cookie! I don’t know why that would happen. I’m going to go research a bit and be right back. So weird, I can’t find anything about cookies getting smaller. Did you chill the cookies before baking? And use my recipe or one that has baking soda or baking powder? I wish I had a better answer. 🙁 If you plan on making much of these kinds of things, I do invest in cookie cutter sets. They are pricey, but I love the options. So I have a set of circles, stars and hearts that have different sized cutters, but all very close in size, for just this scenario!! 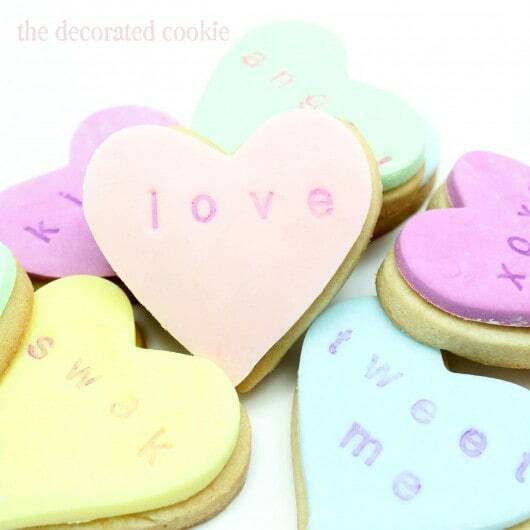 Can you indent the cookies with the stamps if you flood them with royal icing? If so, when would you use the stamps? Thanks!! Hi Jenny, Probably not. If you let the royal icing dry (partially or fully), and then try and indent, the top layer of the icing would crack/break apart imperfectly. You may be able to do so with fondant, which is more like play dough, but a lot of folks prefer the taste of royal icing over fondant.